The 22nd November was a big day in Brussels. While across town at the European Parliament Europe’s leaders assembled to engage in political grandstanding about the EU budget for the next 7 years, another group of science and technology policy makers gathered at SciTech Europe for rather more fruitful discussions. 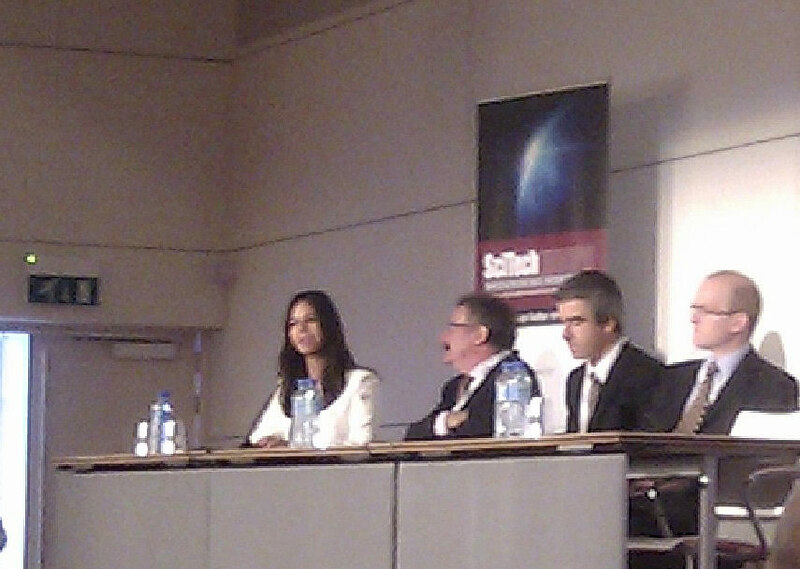 SciTech Europe is an annual event which brings together funders, policy makers, e-infrastructure providers, researchers and industry to discuss the future direction of science and technology in Europe. Although not the largest of events, it’s an international and potent gathering – I met people from Slovenia, Romania, Belgium, Moldova and the UK without even really trying. Keynotes included Charles Leadbeater, author and former government advisor and Professor Martin Adler of the Euroscience Foundation, and the programme also featured a series of ‘masterclasses’ in the areas of technologies for the future, Innovation partnerships, pure medical science and excellence in research. One of these masterclasses was delivered by Steven Newhouse, Director of the European Grid Infrastruture which provides computing and data services to more than 21,000 researchers across Europe. He asked ‘what have e-infrastructures ever done for us?’ Apart from supporting high energy physics, life sciences, environmental sciences, federating clouds, promoting international standards….. You can read more about his nod to Monty Python on the EGI blog (but no silly walks luckily). The event concluded with a star appearance by Professor Lord Robert Winston, Professor of Science and Society and Emeritus Professor of Fertility Studies at Imperial College. (I accidentally upgraded him to ‘Sir’ in my tweets @CatherineGater but no doubt it’s just a matter of time anyway).He was introduced by Jheni Osman, author and freelance journalist who billed him as about to regale us on the future of science and technology. Winston gently refuted this almost straight away. For him, the whole point is that you can’t predict which of today’s cutting edge developments will lead to tomorrow’s ubiquitous technology. He pointed out the example of the laser, an interesting phenomenon when first produced, but lacking any concrete usage. Today you find lasers in computers, supermarket check outs and medicine, for scanning the back of the eye, or even photographing growing embryos. And lasers are not just for everyday use, Livermore University is using incredibly fast pulsed lasers on deuterium oxide in a droplet of water to try to invoke the holy grail of fusion (back to Monty Python again). Not many people would argue that the microchip has been one of the best inventions of the last 10 years. But how did researchers In the US persuade what Winston called “one of the least scientifically literate US presidents in history”, George W. Bush to give 180 million dollars a year to its development? By announcing it was part of the nuclear weapons programme. The point is we don’t predict where we’re going with technology,” said Winston. “And we don’t predict the downsides either.” Microchips with everything, including our mobile phones and credit cards has led to levels of personal tracking that even George Orwell might have had nightmares about. Sometimes research is not even that innovative - Winston showed a map of the spread of vibio cholera across the globe generated recently through painstaking computing which looked remarkably similar to one published nearly 100 years before. Scientists should also be very careful of overselling their work, asserted Winston. Take the Human Genome Project’s much vaunted decoding of the human genome into its base pairs back in 2000. Announced by US President Clinton as an A to Z of human life and by UK Prime Minister Blair as a guide to our humanity, most of the dramatic predictions of what this would mean for human health have so far failed to appear, apart from a few specialist treatments for cancer and rare genetic conditions. “No-one in this room has really benefited from the decoding of the human genome,” opined Winston. In his opinion, it was an error of judgement to say that it was a map to the human genome or a guide to humanity–the A to Z of Washington gives us more useful information and Shakespeare’s Hamlet tells us more about our humanity. At the moment, we can’t produce enough computing power to derive real value from the 20,000 genes identified. Scientists should beware succumbing to what Winston calls “the Science Delusion” – huge extrapolations of their work. This happened to Winston himself, based on his work extracting the DNA profile of a SNIP from an embryo cell. Loder extrapolated from these results in 1995 in a letter in Nature, claiming in the future it would be possible to plug this data into a supercomputer and model the baby from one cell. “I believed all this for about 6 minutes,” said Winston, slightly wistfully. “We are not objective and should be aware of our huge emotional influence on what we see”. The future as he views it is not in attempting to predict where science and technology will take us, but in inspiring the next generation to get involved. At Imperial College where he is based, their ReachOut :ab runs a rather gruesome fake operation workshop for kids to try out. “At the end, they either want to be a scientist, or vomit in the corner,” said Winston rather wryly. On this picturesque note, the concluding panel session kicked off to consider “what is the most effective way of supporting and organising research and development at a European level to ensure Europe remains competitive” (and presumably doesn’t vomit in the process). The panel included Robert Winston, Steven Newhouse, Olivier Debande, Deputy Economic Advisor at the European Investment Bank, Anna Szatkowska an advisor at the Association of European Chambers of Commerce and Industry and was chaired by Jheni Osman. 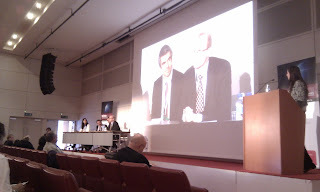 The panel called for better and wider collaboration and of course more funding. Scientists are keen to collaborate but worry about losing their intellectual property, especially as there is no European-wide patent law in place, a long time campaign of Digital Commissioner at the EC, Neelie Kroes. Winston returned to the theme of how to get a cadre of scientists equipped to deal with these global projects. “Times of trouble are when innovation is most accelerated,” he reminded us.”Can Governments do this without the conflict situation – or maybe the current economic crisis is enough to promote innovation?” All agreed that finding funding for unsexy science is tough these days. “E-Infrastructure is one of the unsexiest of unsexy sciences,” said Newhouse with feeling. “Sustainable funding is difficult to secure, but essential for the long term persistence of data so that research can be replicated or reopened in future.” Organisations such as EGI support the fact that innovation can come from anywhere, and are working to promote collaboration internationally. With a nod to the similar discussions across town, the panel considered the knotty issue of identifying future European level funding. Newhouse summed up the situation: “There is pressure on science funding, in the UK and in some other countries. However in my experience, some countries don’t see the problem. To get integration when the situation is so different in different countries makes it hard to get the European cohesion we need. It is this diversity that is the problem rather than the level of funding itself.” And with the European leaders on their way home from Brussels without an agreed budget deal on the table, this could not be more true.